In recent weeks, there has been a lot of talk on our airwaves about people displaying a certain lack of gratitude when faced with the reality of winning a really nice prize. All I can say is that if this is a national malaise, then my wife is not infected. When we won a dream holiday of a 5-day stay in a top hotel in Cannes in the South of France, the levels of screaming emanating from her (as well as her sister screaming in cacophonic harmony) forced me to resort to wearing earplugs when walking around the house for several hours. Excitement levels were still at code-red level as the plane brought us safely down at Nice International Airport. “This must be one of the nice-est airports to fly into,” I joked. But my wife was far too giddy by then to be able to take in such dazzling wit. We had booked the smallest car available to hire for transport during our stay and the 2½-hour wait turned out to be worth it. The tired but still-smiling Hertz representative handed over the last of the paperwork as well as the keys of the car. I went to where I had been told it was parked and pressed the remote control on the key to unlock the car. To our great surprise, a large Mercedes saloon lit up cheerfully. It looked like it was smiling at us. We stared open-mouthed for a few seconds before I locked it again and went back inside to the car-hire desk. “I think there might be some mistake with the car,” I explained. “It’s a lot bigger and more expensive than the one I ordered.” The lady explained to me that it was because of the large crowds that day that they had simply run out of smaller cars and that they had no choice but to upgrade me without any extra cost and she really hoped that Monsieur didn’t find it inconvenient. Not feeling any ill effects from inconvenience whatsoever, we pulled up in our flash car at the very flash Hotel Martinez. This art deco palace to pampering is situated right on the famous palm-lined Croisette in Cannes, overlooking its own private beach and pontoon (where one of its three restaurants are situated) and with its own swimming pool. Once inside the huge, calming interior of the reception area, we were met by our Greek-born hostess Alexandra, who told us that she had a “special surprise” for us. At this point, we were still buzzing from our unexpected vehicle upgrade, but our day was about to improve. As we ascended with our host in the lift standing to attention beside our Super Valu suitcases, we noticed that she had pressed the 7th floor. Having read the hotel brochure over a hundred times, we both realised that there were only two things on the top floor – the Givenchy Spa and… penthouses. 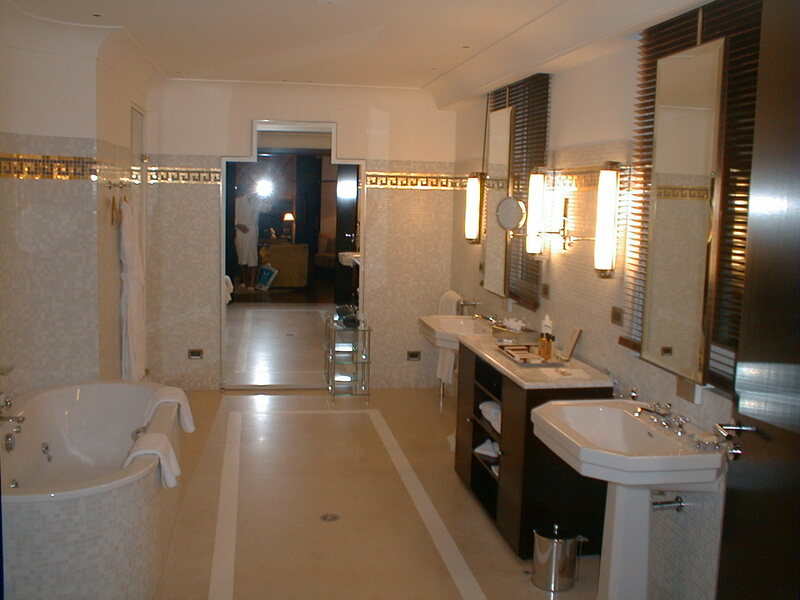 Having never been in a penthouse before, we walked down the corridor (it was so large, it had its own corridor) gingerly at first, half-expecting to see an indignant movie star emerge bleary-eyed in a fluffy bath robe. The walls were adorned with original priceless art works by Matisse, Picasso and Dufy and everywhere was signed art deco style furniture. Alexandra pointed out to us the office/dressing room, the private sauna, the living room/ bedroom with two sets of French doors leading out to the balcony, and the huge marbled bathroom with steam room off. This latter room, it was pointed out to us, went down very well indeed with groups of top models who found its size very accommodating when they were doing fashion photo shoots in the Martinez. I really warmed to the notion of large gangs of supermodels skipping and giggling around my bathroom. I also loved the television. It was the size of a normal double-bed tipped on its side and it emerged at the touch of a button from its pod at the foot of a double bed which was also off the scale in terms of size. It was rather like the kind of screen that a Bond baddie might use for tracking progress of missiles. Like the shutters, the lights, and just about everything else in the penthouse, it was controlled by a large remote-control device. 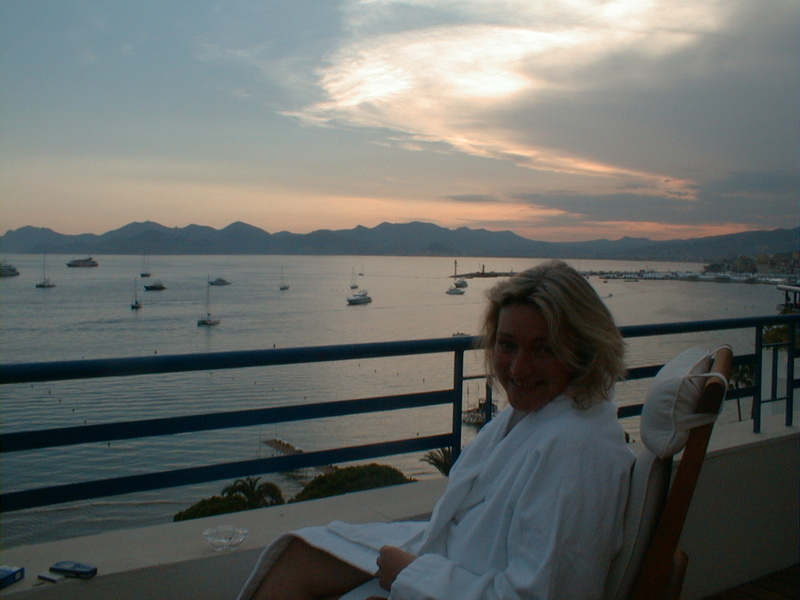 Once the hostess was gone, we immediately changed into exceptionally comfortable fluffy bathrobes and sauntered out onto the balcony to survey Cannes from the top of one of its principal castles. The majestic sweep of the beach of Cannes, the sparkling waters and the numerous unfeasibly-large yachts bobbing gently in the slight swell lay before us – we were already beginning to feel like celebrities. We even spotted some people at street level pointing up at us and talking – possibly tut-tutting at how Brad Pitt and Angelina Jolie had really let themselves go. Later on, we had a pleasant luncheon on the terrace outside at an enormous table with seating for twelve. Our spread consisted of delicious finger food that we had got at the daily covered Forville market, washed down with a superb local rosé. The first time walking past the concierge with a plastic shopping bag felt ever-so-slightly embarrassing. As the week wore on however, our initial scurries through the foyer became relaxed saunters, with our heads held high and our bags clinking cheerfully. 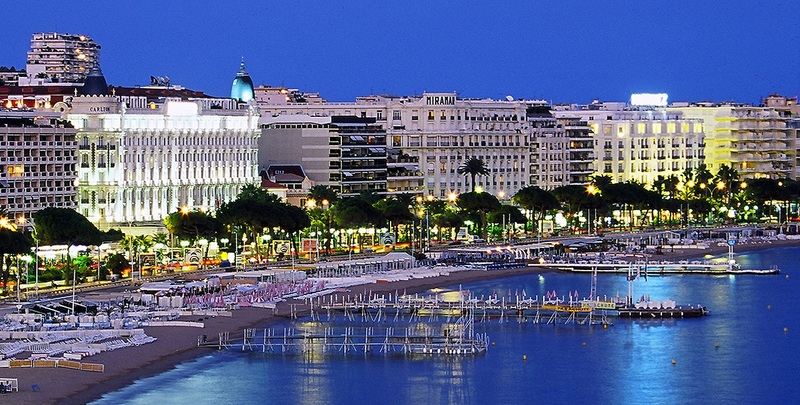 Strolling around Cannes gives the impression of a pleasant seaside French city; one that has an eclectic mixture of Riviera chic and a little bit of mass tourism sprinkled with some full-on trappings of luxury. It’s a city with a Rolls Royce dealership and some large low-price supermarkets such as Prisunic and Leclerc. There are cocktail bars where mysterious bejewelled ladies sip slowly next to silent partners wearing designer jackets over dark polo necks and there are two down-to-earth Irish pubs. It’s a place that smells of celebrity but you don’t necessarily see them all the time. 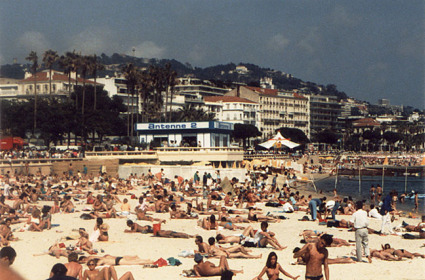 Celebrities do tend to hang out and eat out at the Eastern end of town – basically along the Croisette. Here, you can expect to pay almost any price in seafood restaurants where a view of the ocean and being seen in designer clothing put a premium on the cost of a meal. There’s usually a lively buzz going on at most times of the day or night along the main promenade lining the Croisette. As you reach the Western end, you’ll see the large unattractive bunker-like structure that is the Palais des Festivals, where all the main events are held during Film Festival week. Outside on the pavement, you can find the palm prints of a whole host of American and European film stars, immortalised in hard-wearing concrete. The area opposite the Old Port offers a good deal more in terms of authentic Mediterranean atmosphere – the part of town where the “real” people live, if you like. Known as Le Suquet, this is what existed of Cannes before it became a fixture on The Grand Tour in the late 19th century. Most restaurants and bars offer a wonderful level of service at prices that beat those of the average town in Ireland. The two Îles de Lérin lie just a 15-minute ferry ride away from Cannes. Ste. Marguerite, the larger of the two islands, is where the famous “Man in the Iron Mask” was supposed to have been held, while the monastery on St. Honorat is allegedly where St. Patrick was trained before embarking on his project of bringing Christianity to Ireland. Our guide book described the islands as “paradise facing purgatory”. I quite like Cannes, so I wouldn’t go that far, but there’s no doubt that the islands offer calm respite from the often-hectic Côte d’Azur and a days visit makes you feel like you’ve travelled to an entirely different country. 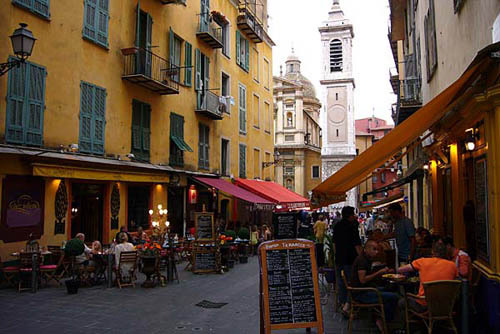 The big luxury names in jewellery, designer clothes and chocolatiers are to be found along the Croisette and in the narrower streets that run behind, linking up with the long Rue d’Antibes, which runs parallel to the Croisette and covers the entire range of shopping choices. The more expensive places are easily identifiable through the minimalist quality of their window displays, as well as an obligatory doorman. In fact, they look more closed than open. Presumably, when one is fabulously wealthy, one prefers to keep discretion at a maximum and any sort of vulgar commercial fuss to a minimum. The Martinez is, along with the Carlton down the street, the most popular haunt for the rich and famous. 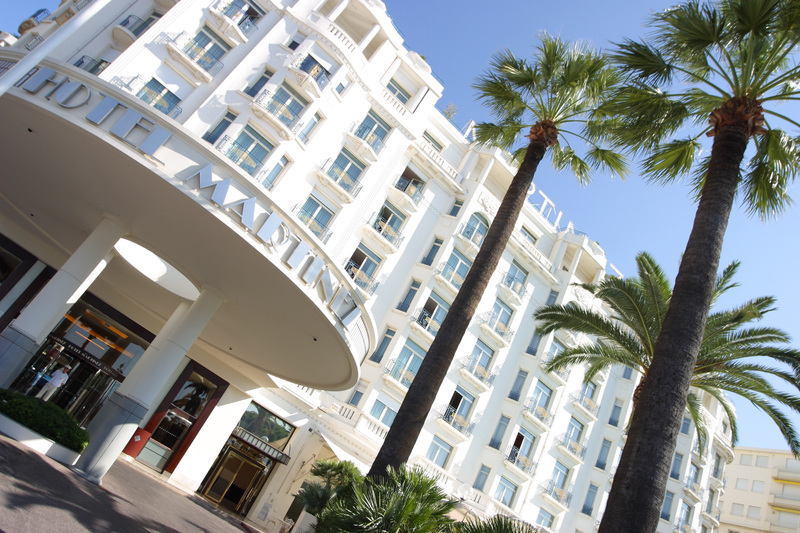 The hotel is closely associated with the annual Cannes Film Festival and there is a long list of celebrities who are regular clients. 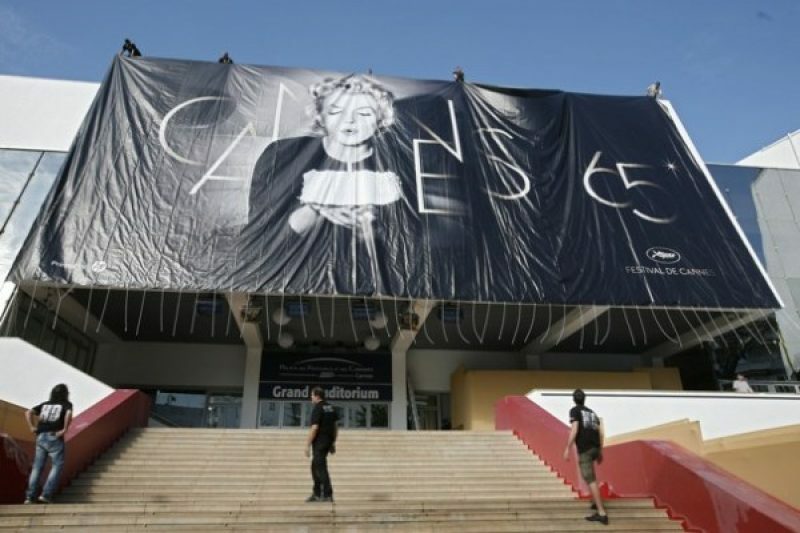 They include Roman Polanski, Woody Allen, Catherine Deneuve, Eva Longoria, Juliette Binoche and Francis Ford Coppola. Film Festival week in May is an important week for the Martinez, as well as for every other business in the city, and it generates 10% of the hotel’s annual turnover. The hotel has regularly topped polls as having the most expensive penthouse in the world: The full-size corner suite (of which we were occupying half) has an official high-season price of €7,300 per night, but during Cannes Film Festival week, the price is said to rocket to in excess of €35,000 per night. We pondered these enormous figures as we sipped our sparkly wine in the warm night air and observed the lights of Cannes shimmering over the calm sea. It was the day before our return to a damper country and a somewhat less glamorous lifestyle. I made a minor adjustment on the remote control so that the behemoth of a telly turned a few degrees so as to give me a good view. Every few minutes, I peeked over the balcony to make sure that the Mercedes was ok.
“Will we ever be able to go back to a normal life after this?” my wife sighed, dressed in a fluffy bathrobe and absent-mindedly manicuring her nails. “Never!” I replied, defiantly raising my glass to grandeur and staring into the distance at the darkening horizon. Hôtel Martinez. 73 La Croisette, 06406 Cannes, France, 0033-4 92 98 73 00, www.hotel-martinez.com. Previous Previous post: News: The Clash of the Extremes – the Defining Story of Next Month’s Elections?